Are we Protestants? Does it matter? COMMENTARY | “Do Southern Baptists consider themselves Protestants?” I was asked recently. The question seemed innocuous. Normally I wouldn’t spend much time pondering how Baptists emerged on the scene, because I would find it outweighed by the question: How does that matter now? But here on the 498th anniversary of the Reformation, and peering over the cultural and moral precipice of the 21st century, I find the question is deep—and important. In my friend’s church background, the teaching is that there always existed on a sort of parallel track to the Catholic Church a string of truly New Testament churches that were faithful to the biblical doctrines of salvation, believer’s baptism, and local church autonomy. They don’t identify themselves with Martin Luther, the agitated priest who on All Hallows Eve in 1517 started a movement—and a schism—with a hammer and nail as he posted his complaints on the door of his church building. 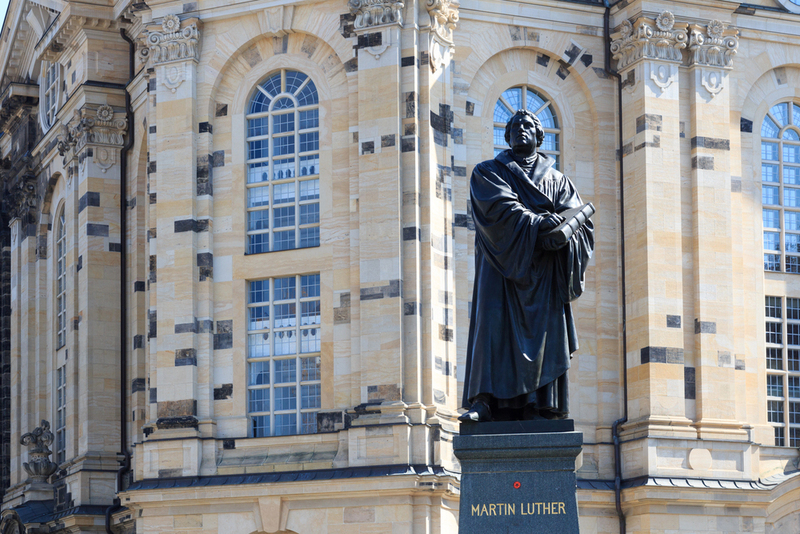 Nor do they fully identify with Calvin, Knox, and Zwingli, Luther’s contemporaries. These Reformers nailed down faith by grace alone, but ultimately they kept the practice of infant baptism and a hierarchical church polity. Methodists technically didn’t “protest” the Catholic Church. They withdrew from the Anglican Church, which was formed by Henry VIII because the Pope refused him permission to divorce and remarry—and remarry—and remarry. About 200 years later, Anglican priest John Wesley got saved and unintentionally started another movement. Not really a protest. But in our day, the denominations that cite these Reformers as their antecedents are called Protestants. Mainline Protestants in America are Lutheran (of various types), Presbyterian (mostly PCUSA), United Church of Christ, Episcopalian (ECUS), United Methodist, American Baptist, and a couple of others. We Southern Baptists never considered ourselves Mainline. But are we Protestants? The reason this is important today was underscored at the symposium on “SBC in the 21st Century” hosted by Midwestern Baptist Theological Seminary in September. All the presenters—mostly seminary presidents and leading SBC thinkers and pastors—referenced the current cultural decline and the need for Southern Baptists to take biblical stands against it. David Dockery, former president of Union University and now head of Trinity Evangelical Divinity School in metro Chicago, masterfully explained the shifts in Southern Baptists’ relationship to the prevailing culture. He recited the SBC’s history as a series of six generations starting with its founding in 1845, each delineated by the death of some significant SBC figure. The period from 1950 to 1980 was one of expansion and accommodation, as the SBC grew dramatically and surpassed the Methodists to become the largest “Protestant” denomination in the U.S. The period was marked by movement toward the mainline, as downhome Southern Baptists moved up in the world. For a while, it was cool to be Baptist. Dockery described how our cultural accommodation resulted in theological drift, identity crisis, and the Conservative Resurgence, intended to stop liberalization of the denomination. From that time, the SBC and society-at-large began moving in opposite directions. Here, 35 years later, we find ourselves on the fringe again, decrying moral decay and building battlements to preserve what remains of our religious liberty. Perhaps my friend is right. Out here on the edge, we are not served well by the label “Protestant.” As applied to people and churches today, Protestant has lost its theological meaning. By it we are lumped in with those who have surrendered their doctrinal standards for the sake of cultural acceptance. Eric Reed is editor of the Illinois Baptist. Read the most recent issue of the Illinois Baptist online. Halloween: ‘All in good fun’? Most Americans don’t have a problem celebrating Halloween, a new study shows. 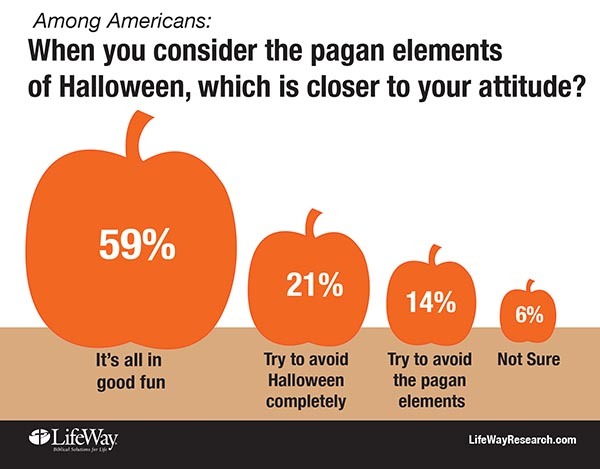 Although 3 in 5 Americans told LifeWay Research that Halloween is “all in good fun,” 21 percent avoid the holiday completely and another 14 percent avoid the pagan elements. The Wall Street Journal has taken notice of the International Mission Board’s budget woes. In the Oct. 25 article, “Cash-Strapped Missionaries Get a New Calling: Home,” the newspaper gives readers (and Southern Baptists) an opportunity to view the staff reduction from outside the denomination’s news agencies. Three disaster relief teams from Illinois will each serve in South Carolina where severe flooding destroyed homes, businesses, and infrastructure in early October. The mudout teams will minister over three concurrent weeks beginning November 7. They will join the work of Southern Baptist Disaster relief volunteers from 15 other states. In Washington State, Bremerton High School Coach Joe Kennedy has been told he’ll be fired if he continues to pray from the 50-yard line before each game. In a letter, Superintendent Aaron Leavell forbade him from “bowing his head, taking a knee or doing anything that might remotely be construed as religious.” The school district offered to provide him a place to pray that is “not observable to students or the public.” Coach Kennedy said he will continue to pray. In his invitation to pastors, conference treasurer Brian Smith of Second Baptist Church in Granite City asked churches to pray for the gathering and for pastors who need spiritual rejuvenation and fellowship. Guest speakers are pastors Timothy Cowin of The Rock Church in St. Louis, Phil Hunter of West County Community Church in Wildwood, Missouri, and Jimmy Scroggins of First Baptist Church of West Palm Beach, Florida. The Missouri pastors are well known in the region for effective church leadership. Scroggins is the featured teacher on NAMB’s 3 Circles: Life Conversation Guide, a video demonstrating how to share faith by drawing a simple diagram. Joining the pastors is Shane Garrison, a Campbellsville University professor who will share on reaching “spiritual orphans.” Garrison is a frequent speaker for LifeWay Christian Resources. He teaches on connecting with unchurched families through Vacation Bible School. A “tailgate dinner” of subs and sliders, chips and finger foods, and hot bowls will be available on Tuesday night. The Disaster Relief mobile kitchen unit will be on hand, and a DR team will prepare chicken and noodles and homemade chili. The dinner will be offered at the church. Cost is $5 at the door. IBSA is subsidizing the meal as an expression of thanks to pastors. Is it Baptist to be multi-site? COMMENTARY | You are probably familiar with the term “multi-site” by now. Maybe your church has already gone to the model, or is considering it. Very simply put, multi-site refers to the concept of one church that meets in multiple locations. Twenty-five years ago, there were fewer than 25 such multi-site churches in North America. Today there are over 5,000! It is a relatively recent phenomenon, yet an increasingly popular strategy for reaching more people with the gospel. Opening up another campus allows for growth that is usually quicker and more cost-effective than building bigger or sending people out to start something new. It is in many ways simpler and more streamlined. You don’t have to reinvent the wheel, but can keep the same name, logo, website, 501(c)3 status, support staff, etc. Resources can be shared more readily. You can be more certain that your own “DNA” is being replicated. I understand the appeal and practical benefits. There are many Baptists whom I respect that have gladly joined the multi-site movement, motivated by a genuine desire to penetrate lostness. But I’ve always had a lingering doubt about whether this method is entirely consistent with our Baptist principles, particularly that of local church autonomy. Now you may be wondering why I don’t pose the question as, “Is it biblical to be multi-site?” It is because I don’t have space to make a full argument from Scripture. I am assuming that we are all Baptists here. And I am assuming that we are Baptists because we believe it is biblical. We are solidly convinced the Bible teaches that baptism is to be administered to believers only. And we believe that “a New Testament church of the Lord Jesus Christ is an autonomous local congregation of baptized believers” (The Baptist Faith & Message 2000, Article VI). Our views about credobaptism and congregational ecclesiology are the principal reasons why we are Baptist, and not Methodist or Presbyterian. But while they may remain firm on the practice of baptism, Baptist practitioners of the multi-site model appear willing to compromise the autonomy of the local assembly. Each distinct location is not allowed the responsibility to receive and dismiss its own pastors and members. There is limited leeway given to determine the best programs and strategies for evangelism and discipleship. In many ways, the satellite congregations are bound by the decisions coming out of central headquarters. When it comes to organizational structure and leadership in a multi-site operation, there may be one single pastor over all the campuses, in which case you have a hierarchy. How is this different than having a bishop? Or there might be a representative group of elders overseeing all the campuses, in which case you then have a presbytery. It seems to me that while the language may be “one church in multiple locations,” what you really have is a small denomination. There are potential dangers in any system, but with multi-site, the pull towards empire-building and a cult of personality is extremely strong. There is also a temptation to trust in a franchise brand instead of the power of the Word and Spirit. I can see how in true revival circumstances where massive amounts of people are being converted at once, a temporary multi-site solution might be needed. But I would rather see this as church planting in slow motion. What all this means is that the task of pastors is not just to do the work of an evangelist (2 Tim. 4:5), but also to commit what we know to faithful men who will be able to teach others also (2 Tim. 2:2). We must be committed to raising up leaders from within our churches who could do what we do and be released from our authority to start other churches as the need arises. Hopefully these churches would retain a similarity and organic connection, without control or formal structural unity. A growing number of like-minded yet independent congregations freely choosing to associate and cooperate together in mission…that sounds more Baptist (and biblical) to me. Nathan Carter is pastor of Immanuel Baptist Church in Chicago. 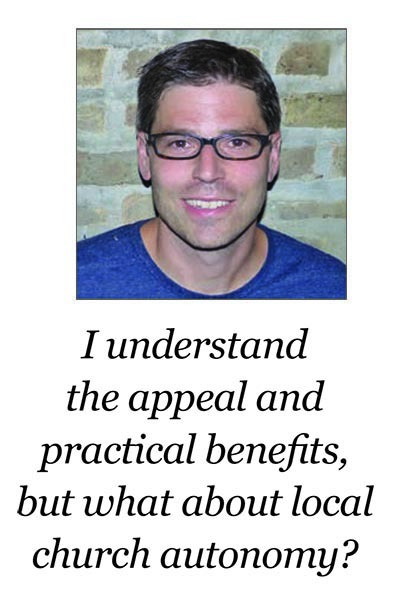 This article first appeared in the Illinois Baptist. Read the latest issue online. 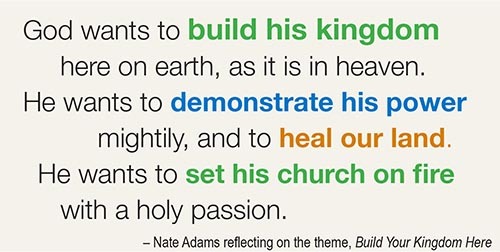 “Build your kingdom here,” pleads the writer of the popular song by the Christian group Rend Collective. With phrases such as “heal our streets and lands” and “set your church on fire,” the chorus captures the desire for IBSA churches in the year ahead. And for those who will attend the 2015 IBSA Annual Meeting, the anthem is a follow-up to last year’s Concert of Prayer for spiritual awakening in Illinois and revival in our churches. And it’s a good summary of the prayers at the upcoming Annual Meeting. “We will be asking God together to move mightily through our churches, yes for our own revival, but beyond that to draw lost people to Christ,” said Adams. The Annual Meeting, set for Nov. 11-12 at First Baptist Church of Marion, focuses on evangelism and key commitments churches can make to reach lost people in their communities. One focus of last year’s Concert of Prayer was the growing number of non-Christian religions in our state, where more than 8 million of Illinois’ 13 million residents do not know Jesus Christ. Mark Emerson and the Church Resources Team have led the way in development of these commitments. “Our thinking in the development of the five commitments came from two ideas. We realized that 342 IBSA churches reported no baptisms last year, and another 100 report one baptism each. One obvious answer: take fuller advantage of Southern Baptists’ best evangelism opportunity. Adams, Emerson, and the Church Resources Team will present all five commitments in the Wednesday evening session at this year’s Annual Meeting. 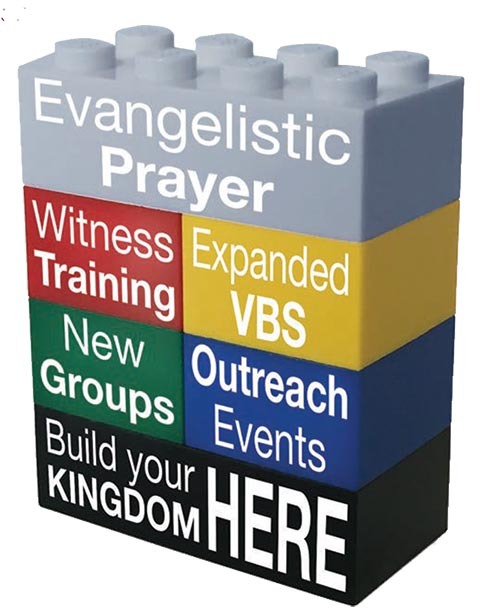 The chapel area at FBC Marion will be set up as a resource room with large displays of “Building Blocks.” Look for the Lego-style blocks representing each of the five commitments. “IBSA staff and resources are committed to coming alongside churches that make those commitments to help them in all five of those areas, and to link them to nearby churches that make those same pledges to renewed, zealous evangelism,” Adams said. FBC Marion is one of four IBSA churches celebrating their founding in 1865. While at the church, look for their historical display just inside the entryway. 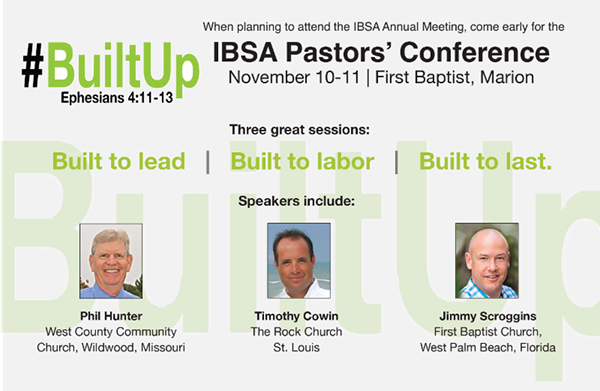 Get the Annual Meeting and Pastors’ Conference schedules, hotel information, and more at www.IBSA.org/IBSA2015. COMMENTARY | Consider it the first see-through pulpit. A century before the plexiglass lectern, black-metal music stand, or repurposed pub table, there was Spurgeon’s rail. The centerpiece of the great Metropolitan Tabernacle in London was not an ornate pulpit. It was a rail, a simple wooden banister with only newel posts at the corners and topped by a little shelf just big enough for a Bible and his one-page manuscript. Behind it, in some photos there is a small trestle-style library table. With the open “rail” extending out about eight feet, there was plenty of room for the preacher to pace about without toppling off the platform. I wanted to stand behind Spurgeon’s rail and preach a bit in the style of the renowned orator, but I don’t know what Spurgeon sounded like. He died in 1892 at age 57. Although Edison had invented sound recording more than a decade earlier, there are no phonograph discs of Spurgeon preaching. His son and successor Thomas recited a transcript of his father’s last sermon, but Thomas’s voice is tinny on the wax cylinder, and we are left to wonder how the man who once preached to an audience of 23,654 without a microphone really sounded. But his words—we have many. Up to 25 million words are documented in 63 volumes of his sermons from his 38-year pastorate. A Midwestern professor is leading the transcription and exposition of recently discovered sermons from Spurgeon’s earliest years in the pulpit. (No small feat that is, as we also saw from pages of sermon notes in his own scritchy Victorian hand.) So the number grows. While he did speak to some of the ills of his day (American editors sometimes deleted his strong comments on slavery), Spurgeon always made a beeline for the cross. 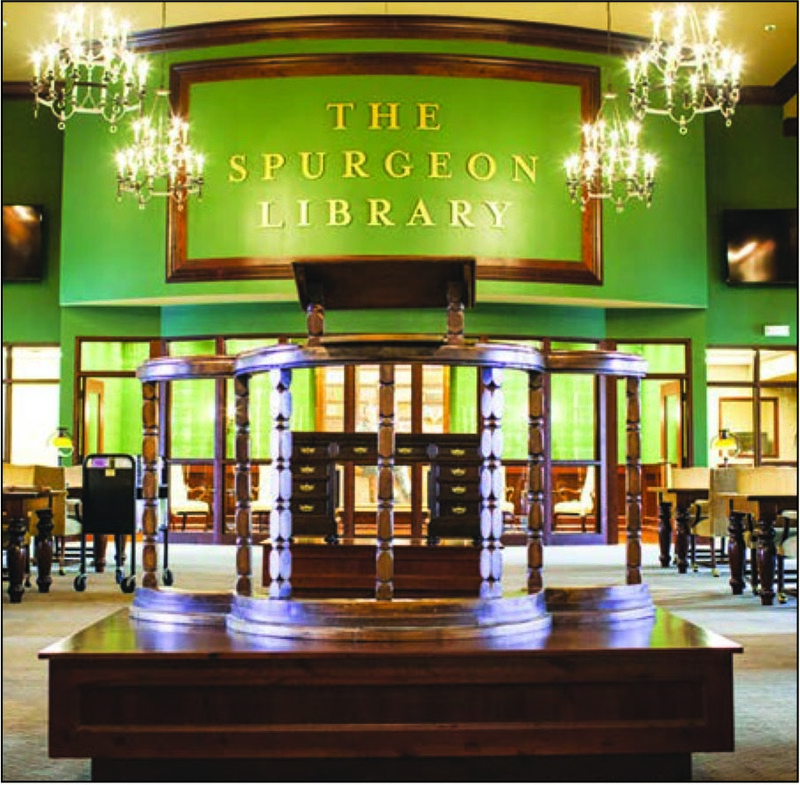 If Spurgeon railed, it was for Christ. We need more of Spurgeon’s rail today. Eric Reed is editor of the Illinois Baptist. 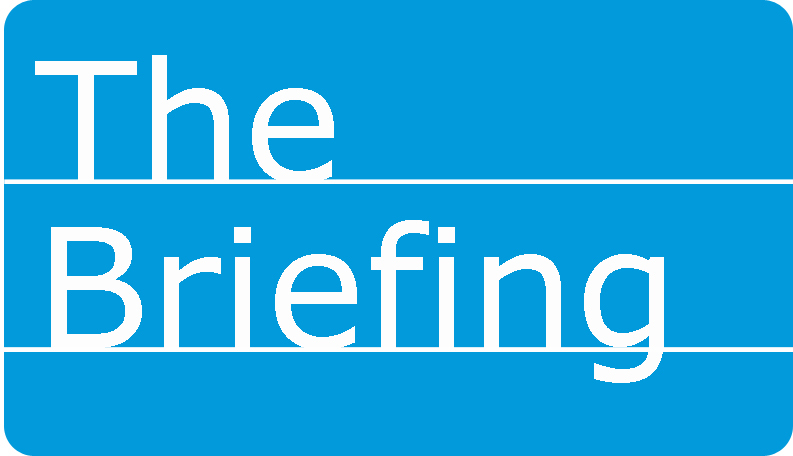 Read the latest issue online.